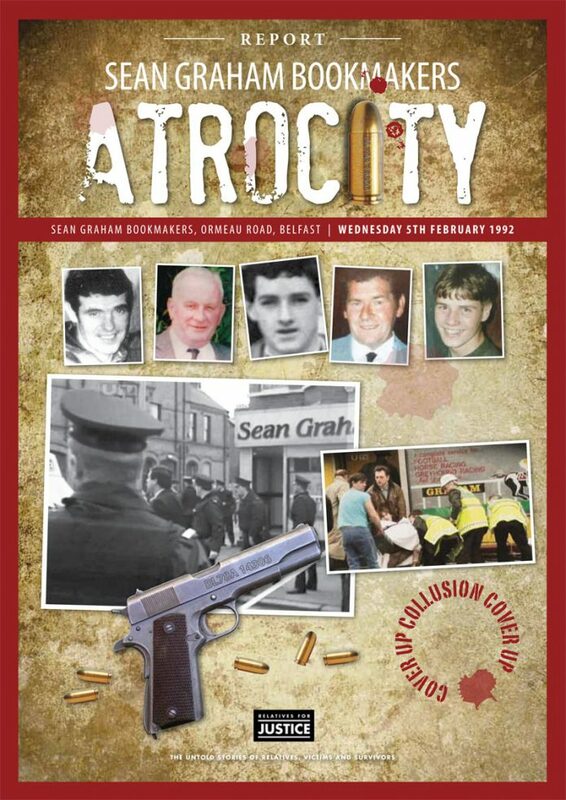 “It’s important to note that this information came to the attention of the Police Ombudsman in respect to the civil case initiated by the families of those killed and injured by the UDA in the Sean Graham’s bookmakers atrocity on the Ormeau Road on February 5th 1992. “This led to PONI becoming aware of sensitive materials held by the PSNI concerning covert intelligence policing that directly impacts not only those killed in the Ormeau Road bookmakers, but also several other related killings in South Belfast, the murder of Damien Walsh by the UDA in West Belfast on March 25th 1993, and a series of 19 other UDA sectarian murders in South Derry and North Antrim during the late 1980’s and early 1990’s. “Scores of people were also injured in all of these attacks. “Relatives for Justice (RFJ) have been supporting a significant number of those killed and injured in all of these attacks. “In respect to the Ormeau Road bookmakers atrocity the families, RFJ and their lawyers KRW Law, have been continually asking and were assured that in the course of the Ombudsman’s investigation that all material has been provided. “Clearly that was not the case. “There clearly is a systemic problem in terms of disclosure concerning state killings and in particular killings where collusion is a feature. “It becomes all the more alarming when the material uncovered relates to intelligence covert policing. “It is only recently that the PSNI ‘discovered’ a computer concerning voluminous material relating to the British army and relevant to numerous killings before inquest and other inquisitorial and civil processes; years after they claimed it did not exist. “That is why we also endorse the call by Dr. Maguire for an independent review of how the PSNI deal with their legal obligations regarding disclosure. “However, this inevitably means more delay for families including that the current Ombudsman’s, Dr. Maguire, tenure expires in July. “This raises significant concerns in that the appointment of a new Police Ombudsman is imminent with interviews by the NIO now concluded with a successful candidate to be announced shorty. “Families will struggle to have confidence in an appointment made by a Secretary of State that has been led by the DUP on legacy and in which the effectiveness of the Ombudsman has been constantly attacked; this notwithstanding that the NIO are not independent and have a vested interest in controlling not only legacy issues but also the flow of information – i.e. disclosure.